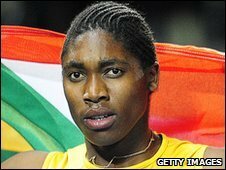 World 800m champion Caster Semenya has vowed to return to athletics at a meeting in Zaragoza, Spain on 24 June. The 19-year-old has not raced since winning her world title last year, when a controversy over her gender erupted. Semenya has agreed to wait for gender-test results to be revealed after a previous comeback in March was blocked by Athletics South Africa (ASA). Athletics' world governing body the IAAF is expected to reveal its long-awaited findings in early June. The outcome of the tests was originally expected to be announced in November 2009, but the IAAF said in March that its investigation was not not yet complete. "I have considered the request by ASA that I await the conclusion of the IAAF's processes by the beginning of June this year before I return to competitive athletics," she said. "Together with my coach and agent, I have therefore decided that I will return to competitive athletics at the European Athletic Association meet to be held on 24 June in Zaragoza," said Semenya. Semenya had previously indicated she may launch a legal challenge to ASA's decision and her treatment by the IAAF, claiming her "fundamental and human rights" had been breached. "Since my victory in the female 800m event at the Berlin World Championships in August last year, I have been subjected to unwarranted and invasive scrutiny of the most intimate and private details of my being," she stated in March. "Some of the occurrences leading up to, and immediately following, the Berlin World Championships have infringed on not only my rights as an athlete but also my fundamental and human rights, including my rights to dignity and privacy." The South African also described the gender verification case as "a very simple matter". "It is vital for my competitiveness, my well-being and for my preparations for events during the European summer that I measure my performance against other athletes," she said. "I am of the firm view that there is no impediment to me competing in athletics competitions." 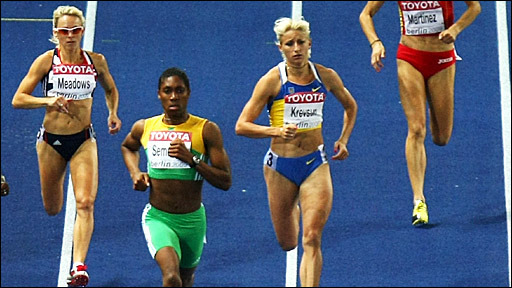 The gender verification tests were performed after Semenya's victory at the World Championships in Berlin in August 2009. In January the IAAF had said Semenya was free to run competitively despite its ongoing investigation into her gender, but that was quickly contradicted by South African Olympic Committee president Gideon Sam who said she would not be eligible until the IAAF had made its ruling. Semenya stormed to victory in the 800m final in a time of one minute, 55.45 seconds - 2.45 seconds faster than defending champion Janeth Jepkosgei, from Kenya, who finished second with Britain's Jenny Meadows winning the bronze.